It's a dark Lifesaver blueberry night, a clay dog growls at a paper moon while one tough hen digs for her freedom with the blunt end of a stolen spoon. The imprisoned chicks are stocked in houses lined up like barracks, a virtual concentration camp, governed by a rigid madam pulling off a very scary British impersonation of the Wicked Witch of the West. Eggs! If you don't produce -- you become skewered with produce! A shish kebab destiny sits uneasy with Ginger, the resilient rebel hen, hell-bent on escape!!! "Are you content to just lay eggs, get plucked, then fried!" she squawks. A wonderfully daft bird chirping Monty-Python like one-liners replies, "It's a living." Attempt after attempt foils, until one fateful night when a flying rooster (Mel Gibson) perchance drops in. Oh my goodness, this is a fun filled film! Well okay, there is a lull. Yes, after the careful, impeccably timed visual humor of the opening sequence, the film does "nest" a bit. So relax enjoy the animation and await an absolutely stunning indoor adventure sequence that rivals any of that live-action stuff from "MI-2" etc. And soon after, a soaring climax that rocks and rolls with swashbuckling fervor and all the emotion you can squeeze from clay! So, tough guys, drop the too-cool-for-a-kiddy-flick demeanor and flock to this film with your fluttering chicks and enjoy the fun, funny, and simply charming escapades of these egg-layers. Don't be chicken! Supposin' you like this film, and I know you will. Rent a couple of excellent, I mean really excellent, predecessor shorts by the same creators ... the Wallace and Gromit series. The "Wrong Trousers" will have you peeing in your pants. (Hey that's pretty funny ... the "Wrong Trousers" is one of the shorts. Ar Ar) Btw, these are some of the same animators who produced that wonderful Peter Gabriel video "Sledgehammer." These people have an intense attention to detail (leaves rolling in the wind, etc. ), incredible patience and perfect sense of timing. Three cheers and a big "Thank you!" to those responsible for contributing this extraordinary work to the greater body of filmmaking. 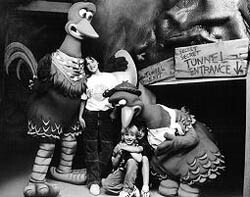 Chicken Run Maze - the new attraction at Universal Studios, LA. In honor of the animated film, Universal has set up a rather simple, but pleasant maze, sort of a kid-sized real-life simulation of the inside of the pie machine. It's cute, though not earth-shattering. You crawl on your knees at one point, then bump into five foot rubber vegetables hanging from wires, then walk across a ramp while circular blades rotate around you. 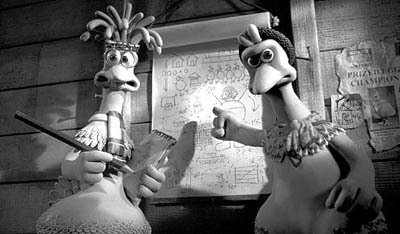 It's the one room "Chicken Run Museum" that is extremely interesting. Displayed are the actual models from the film, the chicken's T2-esque endoskeletons and the inside of a few of the coups. The most impressive being the entire outside of the pie machine all in mini scale. Then there's the behind the scenes video that shows how they did it. Fascinating, inspiring, and chuck full of cool flick trivia (i.e. : each animator on average completed 2.5 seconds of film a day.) One actor quips, "It's really weird to hear your voice coming out of a chicken." 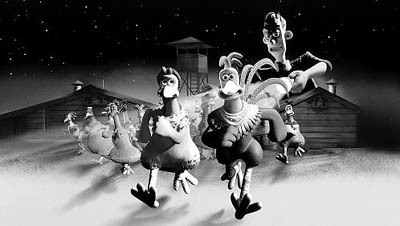 Chicken Run. Copyright © 2000. Rated G.
Richarson, Tony Haygarth, Timothy Spall, Imelda Stauntman, Benjamin Whitrow. Directed by Peter Lord & Nick Park. Written by Karey Kirkpatrick based on story by Lord and Park. Produced by David Sproxton, Lord and Park at Dreamworks/Aardman/Pathe.